We repair Washers, Dryers, Refrigerators, Stoves, Dishwashers, Builtin ovens, Freezers and Garbage disposals. Prevent Fires have your dryer vent cleaned today! 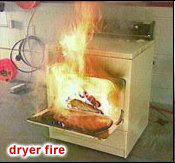 Did you know that dryer exhaust fires now surpass creosote (chimney) fires in frequency in the United States? According to the National Fire Data Center, each year dryer fires cause an estimated 15,600 dryer fires, resulting in 99 million dollars of property damage, 400 injuries, and 15 deaths. Each and every time a dryer is operated, lint is created as water is removed from wet clothing. While much of the lint is caught by the lint filter, lint is also carried through the venting system, together with the moist air. Over time, this lint builds up, and can clog the dryer vent. According to the National Fire Data Center, “the accumulation of lint, both in the dryer and the dryer vent, reduced airflow and created a hidden fire hazard homeowners aren’t even aware of.” Not surprisingly, some fire departments and insurance companies now require that dryer vents be inspected and cleaned regularly. When was the last time you thought about YOUR dryer vent? If the answer is “never” or “not for a while” it is time to have it checked! In addition to lint build up, improper installation of your vent system can also create a serious fire hazard. Our technician can detect problems such as improperly routed vents and damaged or disconnected vents. Ensure your family’s safety with a professional inspection & cleaning.